And, here’s the live edge detection version. Again, pretty straight forward. Same setup as before, but just changed the fragment shader to be an edge detector instead of that cross hatch thing. Really, you can do anything GLSL will support. When it’s supported by OpenCL kernels, then it gets even more interesting because you’re not quite as constrained by the language constructs of GLSL. As I just explained to my daughter. I must say, at this point, it really has nothing to do with the Kinect, other than to the extent that I’m using the Kinect as a cheap source of video input. Actually, it’s not a particularly cheap source for video input. The Kinect for PC cost $250, and requires a dedicated USB 2.0 bus, and is very finicky when it comes to performance. Now that I have the Kinect behaving reliably, and the GLSL Shader thing going on fairly reasonably, it’s time to combine the two. In the video, I am using the Kinect to capture a movie playing on the screen of my monitor. 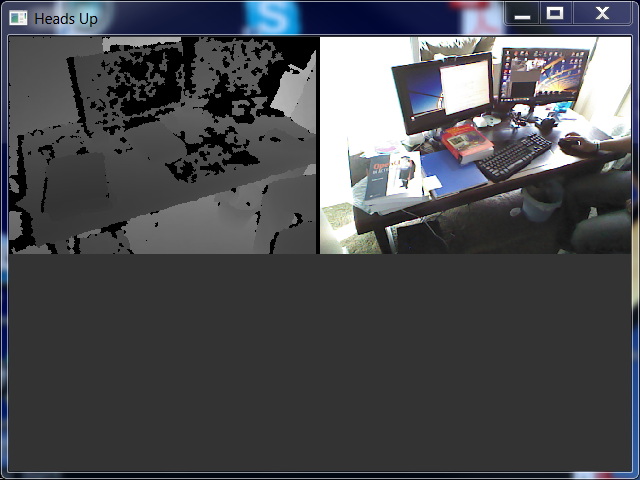 Any live video source will do really, but I might as well use the Kinect as a WebCam for this purpose. The setup for the Kinect is same as before. Just get the sensor, and for every frame, grab the color image, and display it using a quad to the full window size. Second, I just bring in the shader, just like before. The shader doesn’t know it’s modifying a live video feed. All it knows is that it’s sampling from a texture object, and doing its thing. Similarly, the Kinect code doesn’t know anything about the shader. It’s just doing its best to supply frames of color images, and leaving it at that. Pulling it together just means instantiating the shader program, and letting nature run its course. The implications are fairly dramatic though. Through good composition, you can easily peform simple tricks like this. The next step would be to do some interesting processing on the frames as they come from the camera. This brings up an interesting point in my mind. The Kinect is a highly specialized piece of optical equipment, promoted, and made cheap, because of Microsoft and the XBox. But, is it the best and only way to go? The quality of the 3D imaging is kind of limited by the resolution and technique of the IR projector/camera. Through some powerful software, you can get good stereo correspondence to match up the depth pixels with the color pixels. But, why not go with just plain old ordinary WebCams and stereo correspondence? Really, it’s just a challenging math problem. Well, using OpenCL, and the power of the GPU, doing stereo correspondence calculations shouldn’t be much of a problem should it? Then, the visualization and 3D model generation could happen with a reasonable stereo camera rig. WebCam drivers are a well trod ground, so cross platform would be instantaneous. Are there limitations to this approach? Probably, but not any that are based on the physical nature of the sensors, but rather they are based on the ability to do some good quality number crunching in realtime, which is what the GPU excels at. I did the initial interop FFI work for the Kinect a couple weeks back. That initial effort was sufficient to allow me to view an upside down image on my screen. The video was not very reliable, and quite a few frames were dropped, and eventually the thing would just kind of hang. Same as on the XBox actually. Mostly it works, but occasionally, it just kind of loses its mind. Well, I’ve updated the code a bit. But, one of the most noticeable changes in my rig is that I’ve purchased the Kinect for PC. It does in fact make a difference. I don’t know if it’s primarily the slightly shorter USB cable, or because I plugged into a better USB port on my machine, or that MS has actually done something to improve it, but it is better. In this picture, I’m capturing the color video stream at 640×480, which simultaneously capturing the depth at 320×240. It’s good enough that I can display both in realtime (~30 fps). It does get a bit jerky when there is a lot of movement in the scene, but it will run on and on and on. I’ve done a couple of things to the code itself. First, I put evrything into a single file (Kinect.lua). It’s a bit beefy at about 1070 lines, but compared to various other files, it’s fairly tame. That’s about as simple as it gets. To go further, I could have had the stream automatically copy into a texture object, but it’s find the way it is right now. This gets very interesting when you consider the possibly collaboration with OpenCL, and OpenGL shaders. First of all, the memory can be a memory Buffer, or Image2D in OpenCL terms. That can be shared with OpenGL, for zero copying when going between the two environments. So, imagine if you will, you can now capture data from the Kinect with very little glue code. Next, you can process that data with OpenCL kernels if you feel like it, taking advantage of some GPU processing without having to deal with GLSL. The, in the end, you can utilize the results in OpenGL, for doing whatever it is that you’ll be doing. That’s quite a few different pieces of technology coming together there. I think LuaJIT and Lua in general makes this task a bit easier. Once the basic interfaces are done up in Lua, stitching things together gets progressively easier. I imagine I’ll be able to shave off at least a couple hundred lines of code from that Kinect.lua file. There’s some cruft in there that I just did not clean up yet. With this one file, a developer is able to easily incorporate Kinect data into their programming flow. So, now things get really fun. I’m all about the lazy, and avoiding typing when I program. If I had my way, I would just think my program into existance. But alas, I still have to type. But now, I can type a lot less error prone code when it comes to dealing with OpenGL, and in particular with shaders. What’s a ‘shader’? You know, those pesky little programs that you have to write to get anything done on the GPU these days. Hay! Wait a minute. Isn’t that “C” code? Well, not quite. Notice a couple of things. First of all, this is the shader code encapsulated in a Lua string (the []). When you look at the code itself, you see those words “uniform”. Those are variables that can be set from the outside world. In the case of the zooming mandelbrot explorer from the video, I’m changing things like the ‘iter'(ations), and the scale, and the center. My fingers start to cramp even from having to just copy and paste that code. Not only that, but it requires the programmer know a lot more about the intricacies of the GLSL/OpenGL API, which means they spend less time actually coding, and more time doing glue work. Once again, saving my arthritic hands from a lot of typing, and sparing the few brains cells I have left from having to remember a bunch of APIs that I will use infrequently. The functions GetUniformValue, and SetUniformValue is where all the action is at. They figure out what type of field it is we’re accessing (there’s a GLSL API for that), and the construct the appropriate type of array, stuff it with the value, and call the appropriate API to get the values in and out. The, return to the user, and a nice sort of way. You can actually round trip values between get/set, so everything works out great. All the error checking can be put in one place, rather than spread all over your code. Basically, the GLSLProgram function will create an ‘instance’ of a GPUProgram table. That table will have a metatable, which has the __index and __newindex functions on it. These functions will be called whenever a value is not found in the instance of the GPUProgram, or when there is a desire to set a value. It’s a good thing I was able to come up with this little string of code. Otherwise, I fear that I would never be able to make any progress using the GPU. The same little tricks will need to be done to set vertex attributes as well, which is a whole other beast to deal with.